Tell children the story of St. Wenceslaus to teach them the importance of serving others. This is also the day to sing the carol about "Good King Wenceslaus" who went out on the feast of Stephen. St. Wenceslaus has a feast on September 28, but the carol has so attached him to Christmas that we hardly remember him otherwise. He is a hero for boys, though his story is rarely told. He had a horror of bloodshed; once in a desperate attempt to end a bloody war without further loss of life he challenged an invading duke to single combat and is said to have vanquished him by the Sign of the Cross. (He would be a good patron for the United Nations.) He eventually effected a reconciliation with his mother and his pagan brother Boleslaus and invited him to a banquet on the feast of SS. Cosmas and Damian, September 27. The following morning as he was on his way to Mass his brother repaid the compliment by having him murdered — which is why his feast falls on the twenty-eighth. Two years before that, his mother had had his grandmother Ludmilla strangled to death by hired assassins. Bring me flesh and bring me wine; Bring me pine logs hither; Thou and I shall see him dine When we bear them thither. 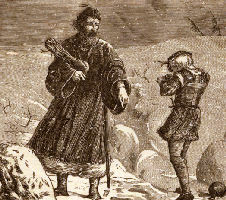 And without ado he tucked his royal robes into his boots and trudged through the cold to the hut underneath the mountain. This spirit of serving is one of the things that needs to be restored to our society. Money is needed, and the needy are thankful for it; but the givers of the money need to do more for their own spirits than sign checks. Like King Wenceslaus, they would refresh their vision of Christ by the experience of serving, by the experience of looking into Christ's face in His poor and feeding Him, changing His sheets, bathing His sick body, shopping at the grocer's for His food. And for every act done with love for Him, He repays a hundredfold. So this day the children may imitate both St. Stephen the deacon, who served, and St. Wenceslaus the king, who served, and set aside some of their Christmas toys or dollars to take to other little Christs less fortunate than themselves. This is hard, but there is an inner joy that children as well need to experience if they would know what we mean when we talk of serving. It is one thing to hear your parents talk about the blessedness of giving. It is quite another to part with something you do not very much want to part with, and then taste the peace and joy and contentment that come to the souls who have given up their own will for love of Christ. In his master's steps he trod, Where the snow lay dinted. Heat was in the very sod That the saint had printed. Children love especially to sing this carol while walking outdoors in the snow. If there are enough who know it (do help them learn all the verses: it makes no sense otherwise) they can take parts, one being king, one page, one the poor man, the rest "voices." And afterward bid them remember, whenever they see footprints in the snow, the saint-king who journeyed to the poor man on the feast of St. Stephen, and bid them help someone that day in imitation of him.